Surprise someone you love with an array of amazing daisies in a charming yellow vase that's bright as sunshine. They'll be singing your praises for days to come. 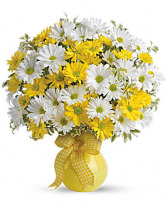 The beautifully bountiful bouquet includes white daisy spray chrysanthemums, yellow daisy spray chrysanthemums and bupleurum accented with fresh greenery. 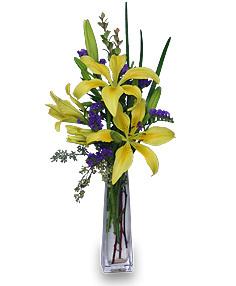 Delivered in a clear glass vase! 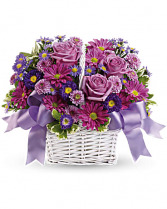 Send our PERFECT LOVE BOUQUET to express your love and affection! 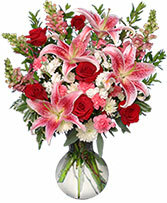 Roses and Lillys make a wonderful combination! We add babies breath and a valentine heart pic!